1 Corinthians 1:10 (ESV) I appeal to you, brothers, by the name of our Lord Jesus Christ, that all of you agree, and that there be no divisions among you, but that you be united in the same mind and the same judgment. Chapter 14: "If Christianity is true, why are there so many denominations?" Chapter 15: "Is Christianity responsible for millions of deaths in history?" Chapter 16: "Are Christians less intelligent than atheists?" Natasha notes, "Some objections to Christianity, however, aren't even about what Christians believe; they're about the results of what Christians believe and the intellectual competence of believers." While I have absolutely no interest in discussing the competence of believers, I do want to argue that the results of Christianity are a direct consequence of the what, and that poses a serious problem for its veracity, as the tree above demonstrates. So, why are there so many Christian denominations? Why would the Holy Spirit lead his people in so many different directions, with each group undoubtedly certain that they've made the correct biblical interpretations? Natasha reassures her readers that True Christians (TM) can be identified by their agreement on these five essential doctrines. Firstly, there is but one God. Yes, I certainly believed that there was just one, that is, until I looked at the first commandment more critically and realized that God was actually acknowledging the existence of other gods. I still don't know why, as a Christian, that never registered with me. Mark 10:18 (ESV) "Why do you call me good?" Jesus answered. "No one is good--except God alone." But Jesus, I thought you were God! Thirdly, the resurrection happened. Of course it did, and no one was going to convince me differently. I mean, how else are you going to explain an empty tomb? Obviously, occam's razor was unbeknownst to me at the time. James 2:20 (ESV) "Do you want to be shown, you foolish person, that faith apart from works is useless?" and verse 24 of the same chapter, "You see that a person is justified by works and not by faith alone." Catholics and Protestants have been parsing the faith and works confusion for centuries. Finally, we have the gospel message -- that Christ died for our sins, was buried, and rose on the third day. 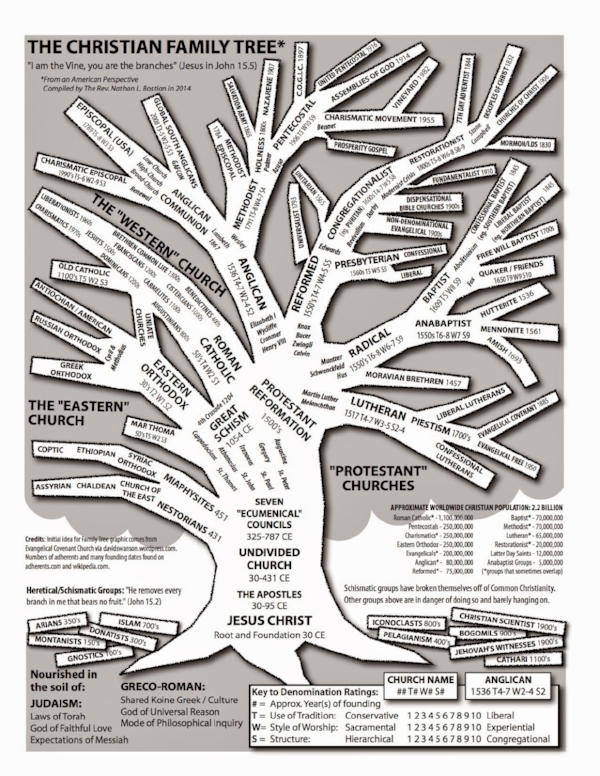 There are many Progressive Christians (not shown on the Christian family tree above) that would absolutely consider themselves true Christians yet do not believe in a literal resurrection. The point is, even the five essentials are capable of generating more questions than answers. Divisiveness within a workplace is usually a reflection of poor leadership, and I think Christianity finds itself in a similar and awkward position. Now, Natasha correctly recognizes that in all fields of study, including science, disagreement is commonplace. The profound difference is that scientists work within the bounds of the scientific method, allowing for modifications and corrections and ultimately a move towards consensus. Christianity, on the other hand, has done the exact opposite. Two millennia have done nothing but allow for more branches on the tree. *Stay tuned for Part Two where I'll cover Chapters 15 and 16!